The urgent need to reduce the side effects of drug administration requires to increase the concentration of drug to the targeted body part of interest. The introduction of nanotechnology, which involves creation and utilization of materials, devices or systems on the nanometer scale, allowed to design and develop nanocarriers able to deliver the drug to a target organ, minimizing the drug’s effects on the healthy tissues, thus reducing its side effects. The application of nanotechnology to medicine, designated as nanomedicine has greatly accelerated not only the treatment of many diseases, but also the diagnosis and the imaging. Target-specific drug therapy and methods for early diagnosis of pathologies are the priority research areas where nanotechnology would play a vital role. However, even with excellent new materials, some questions have to be solved: how to improve a nanocarrier for real applications? What is the state of the art of the research into the drug delivery systems? This e-Book is written with these questions in mind. How nanomaterials are employed in the disease treatment and in diagnostic purposes. 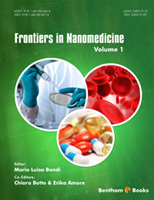 This e-Book edited by Dr. M. Luisa Bondì, Dr. Chiara Botto and Dr. Erika Amore is of interest for not only specialists in pharmaceutical technology, but also graduate students and researchers in materials for drug delivery, biomolecular recognition and medical imaging since “Frontiers in Nanomedicine” links academic knowledge to both research know-how and the avant-garde industrial application of advanced materials for drug delivery systems of industrial application. The problems related to the side effects of conventional drug administration led to a growing interest towards the development of systems able to release drugs selectively into the target site and at controlled rate. Basically, a good targeted drug delivery system should localize and prolong the drug action, with the inherent advantage of reducing the administered drug dose, decreasing consequently side effects. In the field of drug delivery systems, colloidal carriers, and in particular nano-scaled carriers, had a great impact, being made of biocompatible materials and suitable for any route of administration and different pathologies, difficult to treat with conventional therapies. The application of nanostructured materials to medicine has greatly accelerated not only the treatment of many diseases, but also the diagnosis. In fact, the development of nanotechnologybased imaging devices improved the specificity and sensitivity of diagnostic imaging by allowing the non-invasive and quantitative detection of specific biomolecules in humans, enabling the characterization of biological processes at the cellular and/or molecular level. Chapters written by experts will make the reader acquainted with a variety of topics ranging from nanoparticles for drug, gene delivery and for bio-imaging purposes. In particular, Chapter 1 discusses the use of nanoparticles in biomolecular recognition and imaging applications, describing nucleic acids and biomarker detection and focusing on the systems already being translated into clinical settings. Chapter 2 and Chapter 3 focus their attention on the use of nanostructured systems for the treatment of liver diseases. In Chapter 2, the physiology and anatomy of the liver, the epidemiology, natural history and current clinical treatments of liver diseases are summarized, followed by a description of the most common nanoparticle types employed in the treatment of liver diseases, as well as a description of preclinical and clinical evidence for the treatment of liver diseases by nanotechnology approaches. Chapter 3 discusses the available strategies to realize targeted drug delivery to hepatocytes by galactose-decorated nanostructured systems based on polymers, i.e. in viral hepatitis and in liver cancer, when hepatocyte is the key target cell for therapeutic interventions. Breast cancer is the subject of Chapter 4, presenting an overview of different nanoparticulate drug delivery systems developed for breast cancer treatment either under preclinical or clinical evaluation and also discussing different ways to obtain targeted delivery. Targeted drug delivery systems are particularly required for brain-located pathologies, since the blood-brain barrier (BBB) seriously impedes any treatment approach. Recent results demonstrating the ability of nanoparticles to traverse the BBB provide potential alternate means for targeted drug delivery to the central nervous system and novel therapeutic and/or early diagnosis applications. Chapter 5 describes the most recent attempts to develop nanoparticulate systems for diagnosis and/or therapy of Alzheimer’s Disease. All types of nanoparticles which have been employed upto- date to target Alzheimer’s Disease are described and also a brief description of BBB physiology and methodologies used for studying transport of drugs across the BBB are mentioned. Gene therapy is an important strategy for providing treatment for diseases that have been left uncured for decades. Therapeutic nucleic acids comprise different types of DNA and RNA, that need an effective and safe drug delivery system to cross the cell plasma and arrive to the nucleus. In this regard, synthetic nano-vectors are emerging as safer alternatives to viral vectors as carriers for nucleic acid delivery. Compared to the viral vectors, the synthetic ones are more biocompatible, less cytotoxic and can be designed and synthesized to overcome biological barriers and target specific areas of interest. Moreover, they can protect nucleic acids from enzymatic degradation in the harsh biological environment. Chapter 6 highlights recent progress about synthetic nano-vectors for delivery of nucleic acids, discussing some of the common nucleic acids and the mechanisms currently used in synthetic nano-vectors for their delivery. This e-Book provides to scientists a short but reasonably comprehensive overview of the most recent research strategies for the design of drug delivery systems based on advanced materials for nanomedicine applications. It explains the use of nanotechnology in medicine to improve the diagnosis of disease and the role of nanoparticles as targeted drug delivery systems for application in disease therapy and diagnostics. The goal of the authors is to offer to readers an up-to-date understanding of these materials with either a clinical or research interest in this field. CIGMH/DCV, Faculdade de Ciências e Tecnologia/Universidade NOVA de Lisboa.